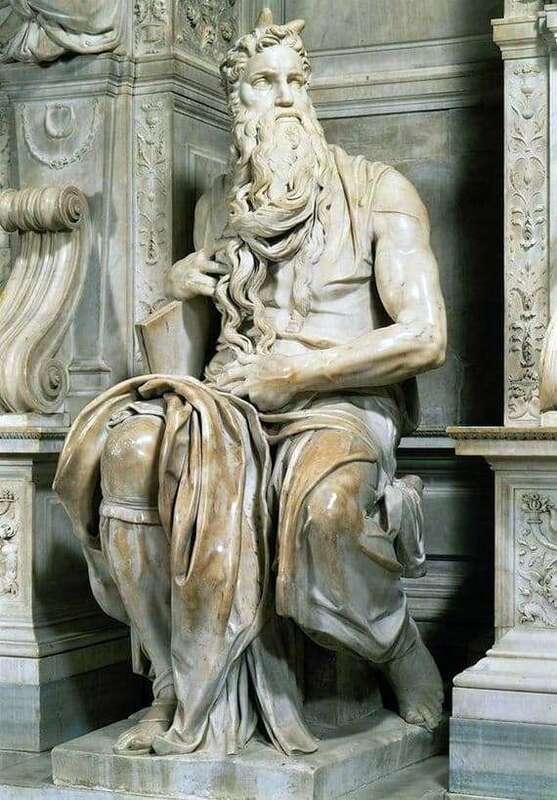 “Moses” – a statue created by the greatest Italian painter Michelangelo Buonarroti. The idea of ​​the author was to recreate the image of the famous biblical prophet. The painstaking work on the sculpture lasted for two years, starting in 1513. For his sculpture, the famous artist used marble as a material. He prepared a huge project of the tomb of Pope Julius II, who commissioned him to create a sculptural ensemble for its decoration. In this regard, initially the image of Moses was conceived as an element of a gravestone. However, with the decrease in the number of planned statues, the constant changes of projects, the image of the prophet became the center of the composition. The sculpture is striking in its height. The size of the sitting statue is impressive – 235 cm. It is filed very dynamically. Moses is depicted sitting posture, but it seems that he is going to get up. He is dressed in traditional antique attire. Emphasis is placed on the massiveness of the head and unusually developed musculature of appearance. Strong relief muscles of the Prophet’s hands fascinate and frighten. The figure is also filled with movement, like other sculptures by Michelangelo. Under his right hand he has the tables of the Covenant with ten commandments, and with his left he goes through his curly beard. The author perfectly conveyed the emotional state of Moses – anger, rage at the betrayal of the Israelis. The alternation of light and surface textures give the image a special drama and energy. In 2001, the monument was restored. The most experienced masters of Italy were involved in the work. The sculpture, as planned by the author, still adorns St. Peter’s Basilica in Rome. Thanks to her, the church has a huge number of visitors.